Find the best student itinerary for New Orleans. New Orleans is one discovery after another. Students come here from all around the world not just to have fun, but to learn and become enriched. Immerse yourself in our unique culture and history by following the itineraries here. 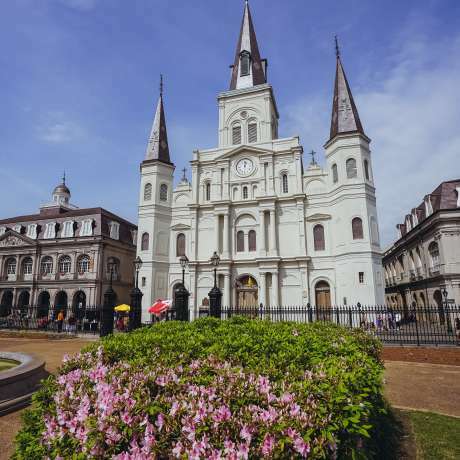 St. Louis Cathedral – Across the street from Café du Monde, through the line of horse-drawn carriages, past the statue of Andrew Jackson in Jackson Square, breathtaking St. Louis Cathedral awaits. Pull up a pew and think about those who may have sat there before you, like voodoo queen Marie Laveau (who was also a devote Catholic). Lunch – You gotta, gotta get a muffuletta at Central Grocery, where the Superdome-shaped sandwich was invented. Take it to go and eat it from a bench on the bank of the Mississippi River where you can watch ships on the river go by. Take a Tour – Literary tours, ghost tours, cemetery tours, Segway tours, LGBT history tours, carriage tours, bike tours … find the one that peaks your curiosity and spend the afternoon discovering the city with a knowledgeable guide. 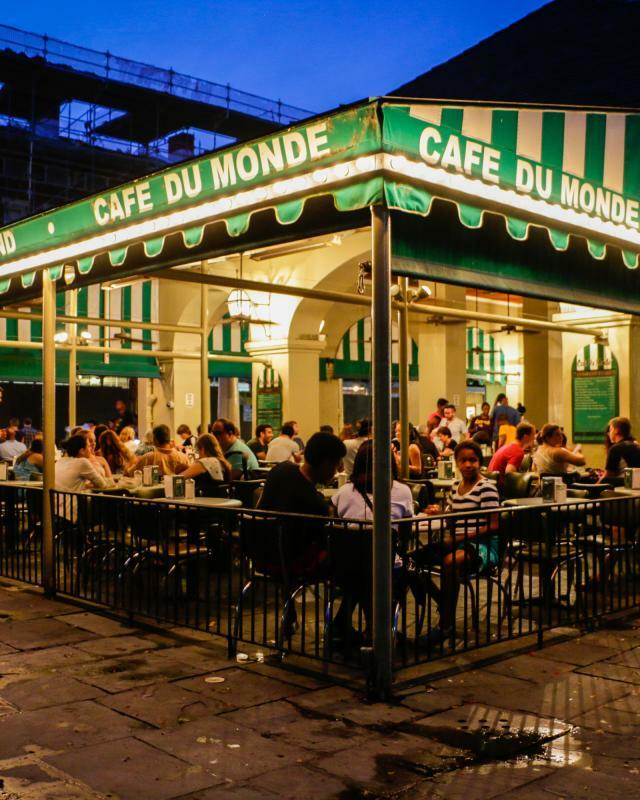 Stroll the French Quarter – The best time to hit the Quarter is early evening when the neon comes on and the music pours out the doors but things haven’t gotten too crazy yet. You can’t go to New Orleans without taking the stroll between the balconies on either side of the rue. Dinner – We suggest dinner at one of our centuries-old restaurants like Antoine’s, Galatoire’s, Tujague’s or Arnaud’s. You’ll get more than a great Creole meal – you’ll get a history lesson. 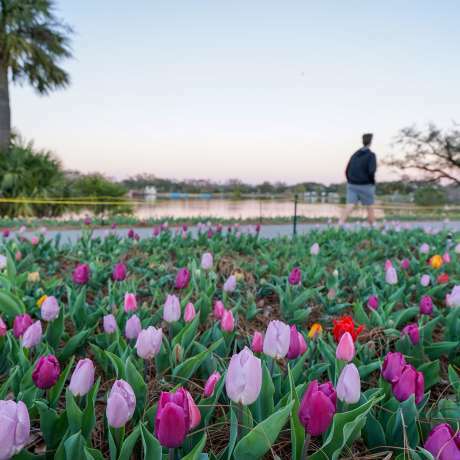 If you have two days to explore New Orleans, spend Day 2 getting to know the Garden District and Uptown New Orleans. This part of the city was settled primarily by wealthy Americans who were not exactly made welcome by the old Creole families who lived in the Vieux Carré (aka- French Quarter). St. Charles Streetcar Ride - Begin your journey Uptown on the world’s oldest continuously operating streetcar, complete with mahogany seats and brass fittings. You’ll travel beneath a canopy of oak trees, passing mile after mile of grand mansions, Audubon Park and the university section. For a full day of on/off privileges on streetcars and buses, pick up a Jazzy Pass for $3. All the places here are accessible by the St. Charles Avenue streetcar line. Brunch – Start your day with Jazz Brunch at Commander’s Palace, which came in at No. 1 on Southern Living’s list of “The South’s Best Restaurants 2017.” No trip to New Orleans is complete without the Commander’s experience. Cemetery Tour – After Commander’s, walk across the street to Lafayette Cemetery No. 1. Either sign up for a guided tour ahead of time, or tour on your own. In 1853, a yellow fever outbreak took the lives of more than 8,000 people in the city. Many desperate families left the bodies of their loved ones here at the gates of Lafayette. Garden District Tour – Greek Revival, Italianate, Gothic, Georgian, Swiss Chalet, Queen Anne … you’ll see them all on a tour of the Garden District. Many tour companies offer combined cemetery and Garden District tours. Lunch – With all the walking you did on the tours, chances are you’ve worked up an appetite. Get off the streetcar at Camelia Grill on Carrollton Avenue. Since 1946, locals and visitors alike have been coming here for the gregarious counter service, cheeseburgers, chocolate freezes (Harry Connick, Jr. loves them) and pecan pie, heated on the grill. Magazine Street – Take the streetcar back to around Napoleon Avenue and then go explore Magazine Street, five miles of fun and funkiness. You’ll find antiques, home décor items, clothing boutiques and fun thrift shops galore. Need to caffeinate? There are a lot of great coffee shops on the street. Grab a table outside and watch the action. Dinner – There are several fabulous options on and around Magazine Street but we love La Petit Grocery, Joey K’s and Coquette. Brunch – Feel like being part of a New Orleans second line? Have brunch at the Court of Two Sisters in the French Quarter and “buck jump” off that bread pudding. Late Night – Experience jazz, “America’s only original art form,” in an intimate setting at Preservation Hall. Come hear the greats play the greats. It's all ages and always fabulous.